I love the adventures of Eli, Kahn, and Valentine. I couldn't wait to see where this installment was going next. In this part, Eli and Kahn are called to do some investigating in a neighborhood. Now there are some weird things going on involving dogs and poltergeists. I loved trying to figure it all out. There's definitely some action and the interaction between Eli and Kahn is fantastic. Now, I'm still trying to figure out exactly what Eli is. We get some more insight but I like that the authors are slowly giving away clues and keeping us on our toes. This series has been refreshing for me. It is so funny and quirky and I'm truly enjoying. You definitely need to pick it up. I was given an ARC.Like the previous 2 books, this was a quick read. The beginning of the book is freaking FUNNY! My favorite part was "Joey silently took the ten dollars with a limp arm, then turned and walked away with this head and shoulders slumping forward at the perfect angle to emote maximum sadness. "In this book, Brenda, the girlfriend is less prevalent in this one. So...all in all, funny in the beginning, more serious in the end. I hope the author continues to add more monsters and such. I really like the interaction between the characters in this book. More of that would be great too! Received a copy for an honest review. Romance is my favorite genre but every now and again a light fun read is needed to jar my senses. This series is quirky, comical, weird, and mysterious. Easily read in a couple hours I always want more, it's too short. Our trio of misfits is back with a neighborhood outbreak of para-electrical ghosts and odd little dogs. Eli has this feeling the dogs are talking to him. Val is determined to understand Eli's chip in his head and Khan just trudges along. The adventure is fun, the battle scenes are epic and I want more. A refreshing comical paranormal mystery is a fabulous way to break out of a reading rut. Call of the Wild is another great book in the Ghost Hackers series. I love that with each book you find out more about each character and about the world where the series takes place. 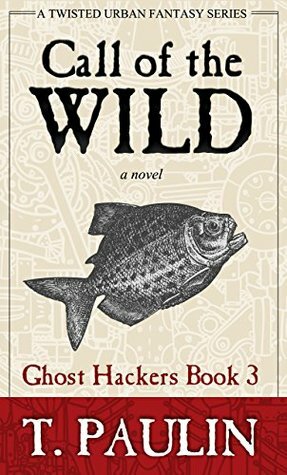 I can't wait until the next book!I received a copy of Call of the Wild: Ghost Hackers Book 3 in exchange for an honest review. Out of all 3 Ghost Hackers books so far this one made me laugh the most. Crazy dogs and poltergeist. Things are coming to light but still keep you guessing. I can't wait for more of the craziness that is Eli and Khan. **3.5**Next installment of the Ghost Hackers series. Eli is still a big kid. Valentine and Khan are still just a little crazy. This time, there are poltergeists and miniature dogs. Good times had by all. As fun as the first two in the series. Can't wait to read the next one!